2875 Overrunning Gear Clutch - Tiny Clutch | Helander Products, Inc. The Tiny-Clutch 2875 overrunning gear clutch is a miniature roller and cam type one-way clutch from our D-Series line of clutches. The D-Series clutches are most frequently used to allow a driven member to overrun the input, or for backstopping a load, they can also function to convert oscillating motion to rotary motion. These clutches use our proven cam and roller principle for long life with trouble free performance. The cam, housing and rollers are made of hardened steel and each roller is energized by a spring which is held square and centered in a drilled pocket. 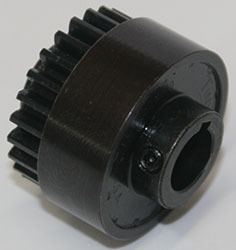 The design of the clutch allows for near zero backlash as well as high free-wheeling speeds. The clutch will not jam in the free direction. The 2875 overrunning gear clutch is based on our D93A roller clutch and features a 24 tooth, 24 pitch, 14.5° pressure angle gear. 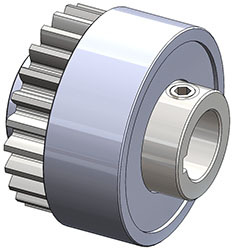 This clutch has a 3/8 inch (9.5mm) bore, the cam is screwed and/or keyed to your shaft, and power may be applied to the clutch through either the gear or the cam. These clutches can be used for many different applications and are the original equipment clutches for multiple brands of hot stamping machines. If you have special needs for your application please Let Us Know.